If you love Starbucks' coffee (who doesn't? ), read this post to see how you can save more on Starbucks. Starbucks Canada announced it would give a free sample of Starbucks Xmas Blend with a purchase of whole bean or ground coffee on Starbucks.ca. Hurry up and get your free sample of premium coffee on the company's website. Before you jump into the coffee buying spree, here is another perk. If you sign up into Starbucks' newsletter to receive more news and valuable offers, you will be eligible for a 10% discount for your next purchase on Starbucks.ca. If you are not an active online buyer, go to your Costco (Ontario, Quebec, the Maritimes) and get $5 off the French roast or Pike Place coffee (1.13kg). A good deal! This deal is valid between October 27 and November 2, 2014. Well, it's not everything. 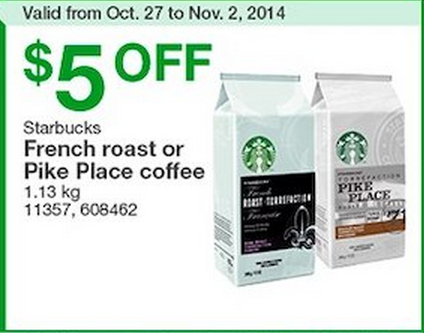 If you live in Quebec, the local IGA gives a free pack of Starbucks' ground coffee for every $70 purchase in store.